While not wishing to downplay the commercial difficulties many farmers face, we have to challenge such oversimplification. Every farm has different costs of production, depending on their size, level of automation, location, staffing, debt etc. For each farm, a dedicated accountant might be able to work out the full cost of that pint of milk (factoring in a percentage of all fixed costs and interest payments), but they would also be interested in the marginal cost (the cost to produce one extra pint) which would be much lower. For some large, automated farms, milk production will still be fully profitable, even with the low prices currently on offer. For others, it may be loss-making if one factors in all sunk costs, yet it is still worth producing milk and selling it to stingy supermarkets because the marginal cost of production is low. Meanwhile a few unfortunate farmers may actually be losing money with every pint they sell, if their marginal cost is above the offered price. P is Price and Q is Quantity. The intersection of the Supply and Demand curves determines the market price and quantity of products that will be sold. The idea that different producers have different costs of production (just as different purchasers are willing to pay different prices for their product) is fundamental to microeconomics. 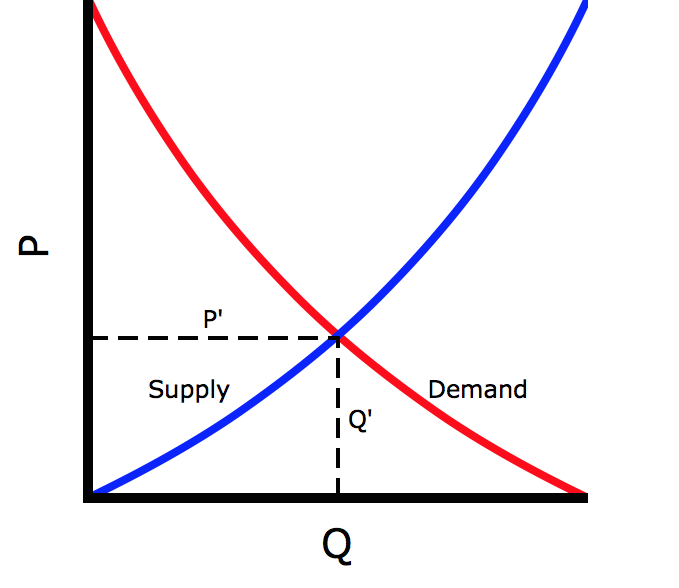 These different producers with their different costs form the supply curve which, where it intersects with the purchasers’ demand curve, determines the price a product ought to command. The reason milk is cheap is that enough producers, globally, have achieved a sufficiently low cost of production to shift the supply curve down relative to the demand curve. If that is hard to understand, look at it this way: the price of milk is what it is because enough farmers are able to produce it for less than that price. In other words, the quote at the top is nonsense. One of the consequences of the supply curve in free markets is that those producers who are consistently lodged at the upper end — above the point of intersection with the demand curve — go out of business. It happens in all other industries, so it would be surprising if it did not happen in farming. It is this process which is playing itself out in protests at supermarkets and in the headlines of our newspapers. It’s not pleasant, but it’s the essence of capitalism and it has useful outcomes such as greater efficiency and lower prices for consumers. Of course, we may not like the way in which farmers achieve lower costs and stay at the profitable end of the supply curve: factory farming, poor treatment of animals, growth hormones and so on. In which case we should be willing to pay extra for premium brands or categories of milk that avoid these practices. Equally, if we want to keep cows on the pastures of British farms, we will need to buy British milk, even if it costs more. In other words, we need to buy from a different supply curve, representing a different product. But we shouldn’t fall into the trap of believing that there is a single cost of production for milk. The UK General Election is here at last. Thanks to the Fixed-term Parliaments Act, we’ve had plenty of time to prepare. Years of informal campaigning have provided us with numerous opportunities to assess the character and aspirations of each of the parties. Yet with just a few hours left, plenty of people are still “undecided”. Why? Is it so hard to choose? Well, yes, and so it should be. Choosing a government in a representative democracy means choosing where railways will be built, which schools will be renovated, what environmental laws will be passed, who will be Minister for Skills and Equalities, when analogue radio signals will be switched off, and a thousand other non-trivial issues. A responsible voter might perhaps feel obligated to study the different parties’ various positions on all these issues, weight them for importance, and then calculate a net score that revealed which party most deserved their vote. Only two people can be prime minister – do you really want to let Ed Miliband into Downing Street? There’s only one party that can control immigration, because only one party wants to leave the EU. A vote for the SNP is a vote to keep David Cameron in Number 10. It’s a choice between a proven long-term economic plan or more chaos from the party that gave us the financial crisis. The Tories want to privatise the NHS; Labour will protect it. Only a strong Liberal Democrat coalition partner can restrain a spendthrift Labour government or a brutal Tory government. Only one party is able to deliver a referendum on Europe. Let Labour into power, propped up by the SNP, and the security and integrity of the United Kingdom is in jeopardy. These are the kinds of arguments political parties deploy most of the time. They know that our short attention spans, our impatient media and our culture of cynicism make more reasoned, complex and nuanced debate ineffective. So although we will be voting on a many-hued constellation of different issues, events and personalities, our political realities have been whittled down to the banal and simplistic choice between black and white. Or possibly white and black. Depending on which school you went to. Are you still fuel poor? It seems this simple redefinition will reduce the number of fuel poor that the government has to worry about from 3.2 million to 2.4 million. The business I’m in is the same business that politicians and corporations are in: it’s a business of selling something that’s important to them by disguising it as something that’s important to you — and it’s ubiquitous.